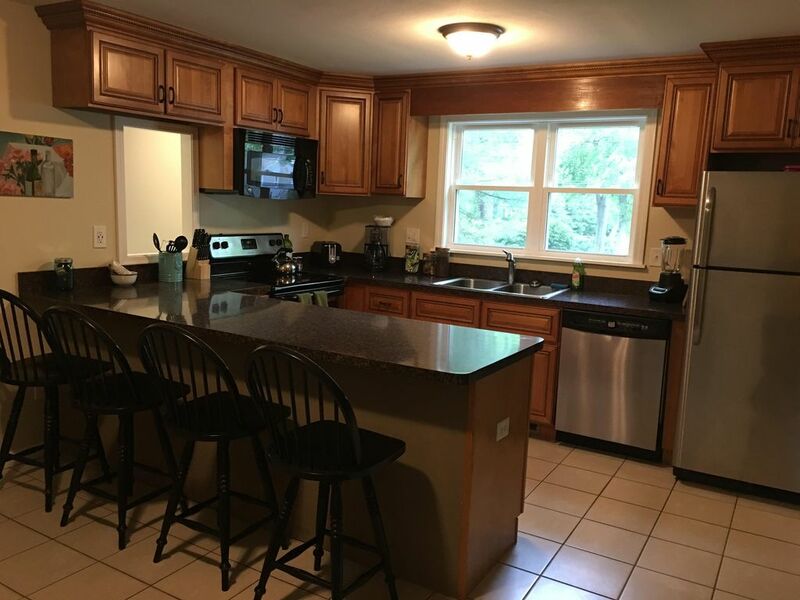 Check out our lovely recently remodeled home that's centrally located, minutes from shopping, the best restaurants, hiking trails in West Haven, Hamden and Wallingford, state parks and many local attractions including Stony Creek Brewery and various award-winning vineyards. If you’re planning a business trip, a reunion or family gathering then our home can provide you with the ideal level of comfort during your time in Connecticut. We are very close to Yale, Quinnipiac, UNH, SCSU, and Albertus. Price includes up to 8 guests, additional guests are $25 per night to a total of 12 people. The entire use of our beautifully newly remodeled house that features 4 tastefully setup bedrooms, 2 baths, a new eat-in kitchen with a 4-seat breakfast bar, a homey family room, a work desk, and a large elevated deck right off of the kitchen. The master bedroom has its own dedicated bathroom with a shower. The 2nd bathroom (tub/shower) is located in the hallway and is available for everyone use. Our home can easily accommodate 12 people in North Haven, CT and is near everything. This home has up to 7 comfortable beds: 5 queens and 2 twins. Our North Haven, CT home can easily accommodate 12 people. If you book more than 10 or more people than we will make a 5th bedroom with 2 queen beds available. Local zoning rules require that the majority of guests must be related (family). We are pet-friendly BUT All pets must be approved by the host in advance, generally, only 2 mid-sized pets with good disposition will be accepted. Guests must clean up after their pets (inside the home and outside) or they will be charged an extra cleaning fee. Tell us about your pets before booking. We do allow SMALL tame/calm parties or events with limits: Small gatherings (of up to the 12 registered guests only) are allowed as long as they aren't disruptive to the neighboorhood or destructive to the property in any way. Unregistered guests are not allowed on our property without our specific permission. We will consider larger calm/tame events on a case-by-case basis, for extra fees and extra security deposit by arrangement. Our yard can accommodate tent & table rentals for events such as rehearsal dinners or graduation parties. ** Provide information about any parties or events that you are considering before booking so that we can be on the same page with regard to expectations. We are experienced long-term landlords and short-term hosts with 17 years experience and solid 5-star ratings on VRBO, Zillow, and Airbnb. We provide quality properties in pristine condition and we know how to treat our tenants and guests to an excellent rental experience. If your family is coming to Greater New Haven for a graduation, memorial service, wedding or other important events then this pet-friendly home is the perfect hotel alternative for family gatherings. Our home is clean, comfortable, spacious, tastefully decorated and has everything that traveling groups need. Prepare & enjoy family meals together in our well-appointed kitchen. Located in North Haven, this home is centrally located to all points in Greater New Haven, the Connecticut Shoreline and about 30 minutes from Greater Hartford. Comfortable gathering spot right off of the open floor plan kitchen and dining area. This home is in a fantastic location and was great for our stay. Lots of room for our large group. The host was very quick to reply and offer suggestions for the area. Thank you for staying at our property and treating it do well. Not sure how the cleanliness rating is showing up as 4 stars, must have thumped that when typing in the app as our intention was 5 stars across the board. What an amazing house. I stayed here with my family. Rick met us at the door showed us the place and then gave us our privacy. He is extremely kind he even left us a bottle of wine! We really felt at home here with full cable to watch the game, and a kitchen to have a meal. Beds were comfortable bathrooms were spotless neighborhood was quiet. 10/10 would recommend. Great Rental in North haven! My wife and I were building a house and needed a place to stay due to construction delays. We found this clean well maintained house within walking distance to almost everything we needed. I enjoyed my brunches at Bagelicious and good Italian meals at Bilinis. The owner was an absolute pleasure to deal with and I would highly recommend this house. The renter was friendly, left snacks for us, and provided good customer service. I would recommend this property! Thank you for the kinds words and treating our place so well. You are welcome back in the future. Great spacious home with everything you need! The home is great, has everything you need, very comfortable beds, nice kitchen, quiet neighborhood and easy access to the highway. Hosts are very attentive and communicate quickly and clearly and are eager to help make your stay the best it can be. Would definitely recommend!! Thank you for staying and being great guests!! We look forward to having you back again in the future.